So we can no longer use BAM!? Are you not going support BAM! any longer? My understanding is that BAM! My understanding is that BAM! is an account manager (AM), as oppose to a statistics aggregation site. Now the same person runs BOINCStats and developed BAM!, and you download BAM! from the same Web site as BOINCStats. Now I don't use these services, but my understanding is the following. If you do not enable the statistics aggregation, BAM! should still work. However, your stats will not be aggregated on BOINCStats. Maybe someone who uses Albert@Home with BAM! could test this out for us and get back to me (via DM). Thanks Killersocke! I've fixed the link. "....This is set to 'No' (disabled)....by default"
Where? On A@H? This option doesn't even exist yet on E@H.
Also, if changes are made to allow existing users to positively consent to the changes what's going to happen to accounts where consent is actively withheld on those pages and (more to the point) to accounts where an active consent/reject indication is never made? what's going to happen to accounts where consent is actively withheld on those pages and (more to the point) to accounts where an active consent/reject indication is never made? You won't be able to use our website anymore. At least the website is now updated and showing the settings. This Process should ALL be covered in the BOINC Client Software, you install it your are saying Yes. I'd like to say well done to the team that implemented this. It could have been a real mess like over at WGC but this was a very smooth rollout and easy to follow instructions to export data. I think we all agree with you on this. The problem is that BOINC is open source software so you can't really enforce a strict timeline for new features - while the GDPR does. This is why we opted to go live with this. We want to be on the legally safe side. 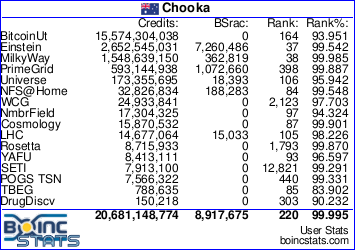 That said, we're already working actively to get the required extensions into the BOINC Client/Manager and then also into the account managers like BAM!. As always, it's just a matter of time but we're on it. I would like to know if these changes will allow Einstein@home to now be included as a project for the Gridcoin team. I prefer E@H over Milkyway@home or Seti@home but Gridcoin was not including E@H anymore. This is mostly independent of the sadly ongoing Gridcoin issue which I commented on here. It will be better, to make it more beautyful and friendly. I want to remind people that in one week, our stats exports will change and honor the option Do you consent to exporting your data to BOINC statistics aggregation Web sites? If you want to have your stats exported, and have not changed this setting, to YES, please do so in Account -> Preferences -> Privacy. Also, I have been informed that at the BOINCstats Web site, your user history may be lost if you do not consent to the stats exports before we update our systems on 2018 Dec 17th. If this is something you care about (BOINCstats history), please change your privacy preferences. Welcome to the family and thanks for supporting us! (I don't understand GDPR) Is it necessary? The stats don't identify individuals, just a group of computers. Maybe if world-facing IP addresses were included, but I'm not sure they are as I've never checked from outside. I almost missed this, was there an email sent notifying of this breaking change? 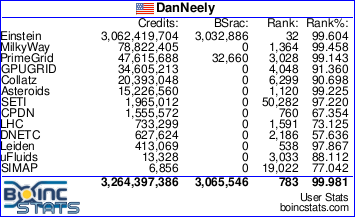 It is a pretty easy thing to overlook a notice in BOINC manager. I hope that sharing of stat history missed is possible if features are implemented that stop the sharing when this opt-in enforcement begins. Second participants who want to share in one project should be given the option to share all their projects stats without needing to go to every project website. This is a feature addition to BOINC so why not make a universal preference controllable via the BOINC client? (I don't understand GDPR) Is it necessary? The stats don't identify individuals, just a group of computers. GDPR not only covers the individuals themselves but any information they give to us. Or at least that is according to what our Data Protection Officer (DPO) as well as any legal advice we have received. Thus we must ask for users' consent when distributing this data. Was there an email sent notifying of this breaking change? We typically make these kind of announcements on the BOINC Manager News as well as in the forums, as well as Twitter. How to contact thousands of people for E@H is not a trivial problem and we try to use multiple message platforms. Also, we typically don't email volunteers because it's a privacy preference to opt-out of emails, and thus we won't reach everyone that way either! What you write of is similar to the Science United project. I agree with bcavnaugh. From now on we dont have useful stats any more. And i think Einstein@Home really, really strong overshoot the mark of the GDPR. To add the option is OK, but the standard should have been "YES"
Why should i compute for Einstein any longer if i dont know how i perform compared to the rest of the world? The number of answers to this thread will match more or less to the number of people who switch the GDPR-fear off. Are all boinc projects offering this option and if so, turning it off by default? That's a lot of work for me performing the task of approving sharing of my data on all projects I participate(d) in. Mind you I am not a statistic hound or else I would be purchasing top of the line hardware to assist in the myriad of distributed projects existing. The sharing of information calculated by each participant helps show others considering joining these projects how many others are participating as well. Done... Thank you for the notice. Are the points similar to "Whose Line Is It Anyway?" points? I don't understand why so much information is shared with such services. All they need is your cross-project ID and your credit. Right? I don't even see any of the computer/hard drive/memory bandwidth information on those sites. Am I missing it? How is this information relevant for there purposes? Is there no requirement in the GDPR that shared information is necessary, appropriate, and granular? Is it for sure that the data export doesn't include email of participants? I assume that any stats site will get anonymized data only? What you're asking is a violation of Art. 25 GDPR. Rest assured that we carefully analyzed the situation and made informed decisions after getting legal advise. We're trying to implement these things in the least invasive way possible, in our own interest. First, we hope you're mainly participating in E@H to support our science ;-) Second, you may still compare your stats against everyone else who wants to publish their data for comparison. Most projects currently are not. Of those that have commented publicly, I'm not aware of any that have interpreted the ambiguities in the law as strictly as E@H's lawyers have. (And I suspect most smaller and/or non-EU based ones are either taking a wait and see approach or are unaware of the potential issue at all.) IF E@H's interpretation is overly strict or other projects are overly lax won't be known until at least one, and possibly several, rounds of litigation between companies whose business includes collecting and making money from user data and EU Govts/privacy advocates have gone through the courts. E@H's strict interpretation likely has something to do with its European arm being based in Germany. Largely in reaction to learning how thoroughly the Satsi (East Germany's Secret Police) were spying on the population, modern Germany is particularly sensitive to privacy concerns. Well, this is a question of what intentions and purposes these stats sites or leaderboards have. I think the original design wanted to provide the community with the means to compare users and computers on more than just the (cross-project) ID, for instance their country of origin or the operating system or CPU type used. Apart from that, this is question that should be directed to BOINC as a whole or the various stats sites as it's independent of the individual projects and rather a part of the general BOINC ecosystem. We as a project just try to stay compatible with the rest of the BOINC ecosystem, and that includes the stats sites, while ensuring legal compliance in the interest of our users. My simple problem with GDPR - it DOES NOT APPLY TO ME. I do not have to abide by any of it's rules or regulations whatsoever. I realize that others DO - but do not appreciate my having to do even a single "click" somewhere because of it. As a programmer, I know what data you store and that you have no way of knowing if this law applies to me or not, so CAN'T default me to a "yes", but it's just annoying. Plus the law as written is over-complicated, unreasonable, unworkable, overly intrusive, impractical... I could go on. But - not my problem, except for all the places I have to make some extra "click." All other data is not personal, only statistics. Nothing to be secured. And of course i will continue crunching from time to time. But not as enhusiastic as in the past. Well, you can say it's not personally identifiable information (PII), like your full legal name, but it is "linked" to PII, like your eye color and your age. Those are just statistics, too. The shared account information includes your account name, join date, country, and time zone, just for starters. And, in addition to that, the computer details for all you computers are shared, which is almost unique to you when taken all together. It's not as if it is anonymized; that would be a completely different thing. I mean, I think I'm going to keep sharing it too, but it should be treated as unique. Pseudo-unique? And, that means it shouldn't be shared lightly. It doesn't apply to you for entities (websites, businesses, etc) who are based outside of Europe. But European entities are required to follow the GDPR for all of their users; where ever in the world we are. E@H is partially based in Europe and thus is required to follow their interpretation of the GDPR for all of us. Project output looks awfully empty today. I guess it's related to this topic. Sort of, yes. BOINCstats has a safety-procedure that is supposed to prevent faulty data imports. That got tripped by the significant change in our data exports so the guys had to give their manual "Go" for the import. They've done that now and the data will be updated during the next import run tonight (CET). So If He Dies, He Dies! I can say one thing about EU! All of which were, AFAIK accounts associated with the E@H program itself. Well, I missed that deadline and enabled the export option only today. What now, are all my stats erased forever and sent to /dev/null ? your stats should reappear within a day, obviously without historical data, though.